Uhuru Kenyatta was inaugurated as the fourth president of Kenya this month on 9th. My hearty congratulations Mr President! Amidst all the controversies surrounding his presidency, I think, he will be a very efficient leader as he is a shrewd businessman and a seasoned politician. I am personally very happy that I have met him and shook hands with him in Kenya, some years back. One summer when we went to the coast, I fell in love with Mombasa, the coastal town because it has pristine white sandy beaches with a warm weather and a lot of seaside activities. We went with a family friend who has an exquisite taste for fine things. He suggested that we should stay in a real good hotel and chose Voyager Beach resort. Voyager is a ship-themed resort with anchors, decks, sails and ship wheels decorating inside and outside the hotel. The lobby is like the interior of a dhow with gunny bags, ropes and mast like structures. The ambiance, food and the entire experience captured our hearts and is etched as an everlasting memory. I was awed, thrilled and impressed as it was my first time in a themed hotel on the beautiful Nyali beach. Pictures here . After our ride in a glass bottom boat to see the rich sea life on the coral reefs underwater, we returned to the hotel, took a shower and headed for an early dinner one evening. At the restaurant, the host greeted us personally and shook hands with us. My life in Kenya had just started and I did not know the geography or history of the country. Soon after the host left, our friend explained that he was the owner of the hotel and the son of the great freedom fighter, the first president of Kenya, Jomo Kenyatta. My jaw dropped and I looked behind to have another glimpse of him. That was my brief interaction with the present president and it is no wonder I feel so proud! When we live in a country for more than 10 years it becomes a major part of our life, culture and thought process. It occupies a large section of our mind and development. It also remains as a significant past you can relate to. When I lived in Kenya, I did not just breathe the air and eat the food but I changed my life style, dressed in the bright outfits and merged with the surroundings. I drove on those roads, closely depended on the people, watched the gorgeous wild life and was affected by the political conditions. We were introduced to the East African food on such trips. One has to enjoy the food to appreciate it as it is an acquired taste. There are no spices, no chillies and very little salt and we get close to the flavour of the vegetables, grains or meat. It is an experience! I learned it after many taste trips and now I can even eat leafy salads without whining about it being bitter or bland. I am the only vegetarian in the family and I used to order a main of Ugali with Sukuma wiki stew, some fresh juice and sit back and enjoy the birds chirping and the butterflies fluttering by. Whereas, the other members enjoy special cuts of various animals barbecued or stewed, with a dash of sides. The side dishes would be french fries called chips by Kenyans (British influence) and salad. Our son would be playing, invariably with the cat that roams the garden, until food arrives. It was an abode of pure bliss! Okay, let me drag myself out of that beautiful landscape now! I talk about Kenya with a passion because my mind is still there, basking in the sunshine. Our family loves to go back there one day, but you may think why we left the country in the first place. Security is a major issue and I do not blame anyone for it. It is, I guess, due to the big divide between the rich and the poor. We make it at home when memories of the past start haunting us and the taste buds long for the simple pleasure. 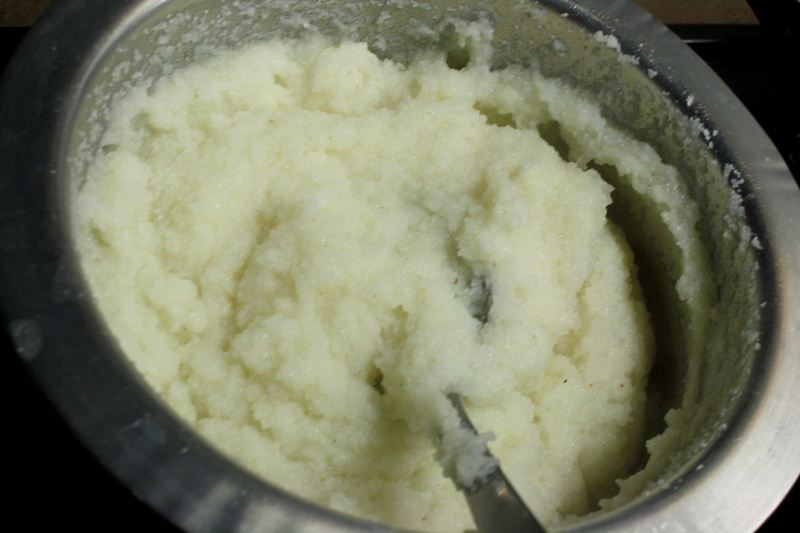 Ugali is made by boiling water and adding white corn meal little at a time. It lumps easily, so stirring and adding a little, like making uppuma is the best way to go. The water should be like 2 times more than the flour and it will absorb the water as it cooks. I add a little bit of salt to this porridge when the water is boiling. Chop onions, garlic and tomatoes. Heat oil and sauté onion, garlic and then add tomatoes. 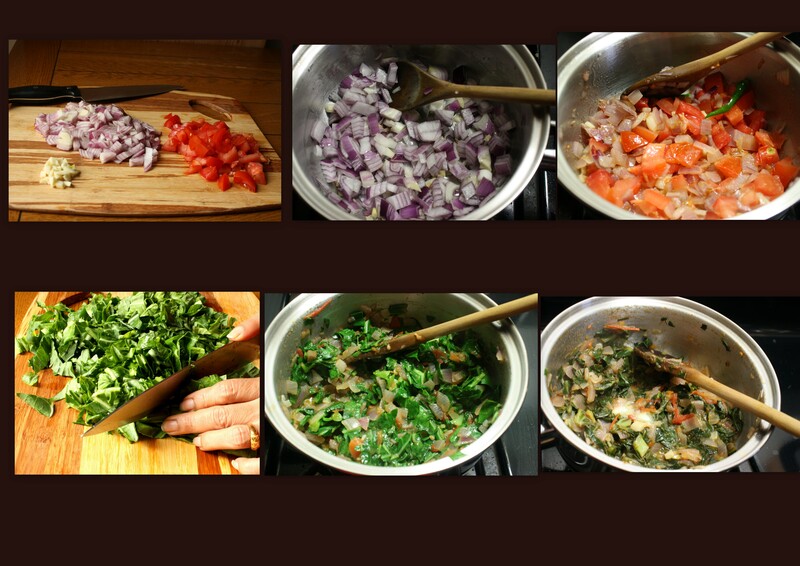 Chop collard greens into smaller pieces and add to the pan and cook for a while. 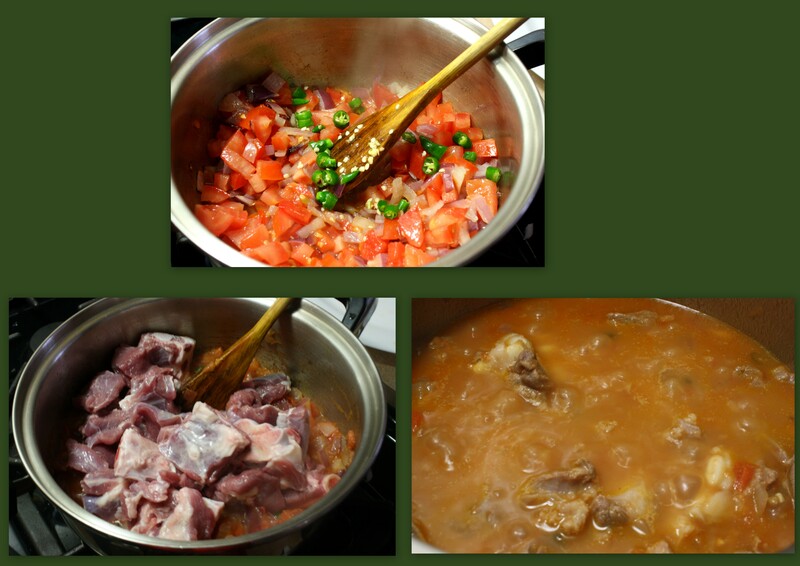 For the meat stew, instead of greens add cleaned mutton pieces and allow it to cook till tender. This food looks simple but it is the yummiest! In the early days, I learned to cook Ugali from my house help who was taught this skill when she was a young girl. When prepared on a charcoal stove it tastes out of this world. Garlic and chillies in the stew are my addition to make it more fascinating. 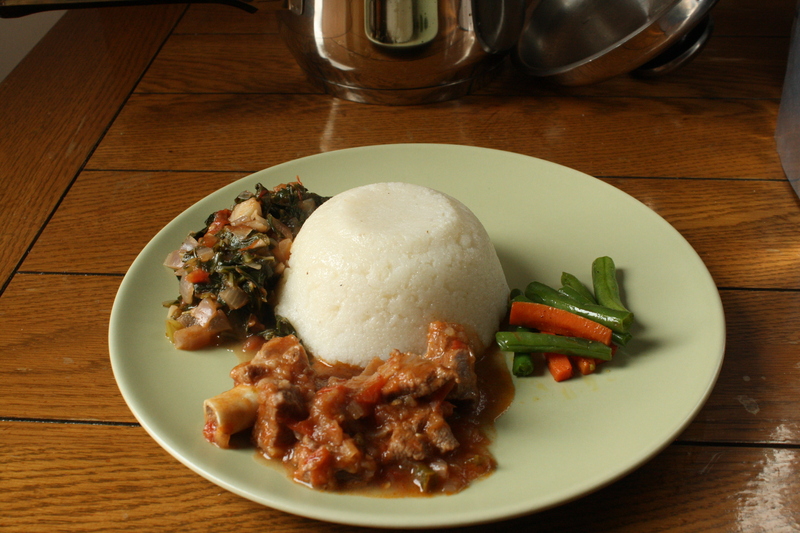 This entry was posted in Main dish and tagged collard greens stew, Corn meal porridge, Kenyan food, mutton stew, Sukuma wiki stew, Ugali, Ugali and stew. Bookmark the permalink. I have heard about ugali from my Kenyan students but over here we are big eater of rice. That said, mutton stew is our fav and your version is so flavorful. I adore it very much. To enjoy this food we have to erase all the past spicy food experiences and get back to the basics and savour the subtle taste. Thank you for the lovely comment. A healthy diversion from our staple roasting, frying and bunch of spices….looks yummy too.. Yes, it is a different approach and satiating! 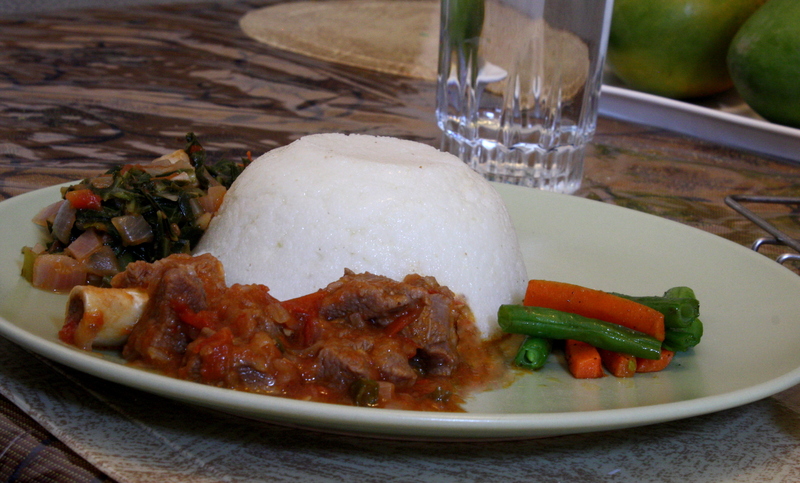 The Ugali and stew reminded me of the food I ate on a trip to Tanzania. So tasty!